[Updated] Citizens Uprooting Racism in Bermuda today announced the launch of “truth and reconciliation community conversations” beginning in February 2017. “CURB will provide guideline topics for each meeting, as well as resources that can be shared with groups in advance prior to the gathering. “It is envisioned these groups will forge relationships, build community and find ways to create change within their own sphere of influence, and then share with the greater community,” said CURB president Lynne Winfield. CURB said, “At the end of the 3-months, the groups will meet as one to consolidate their ideas. Additional groups will be formed later in the year and the process will begin again. Members of the public are asked to register by emailing admin@uprootingracism.org or by calling 505 0112. “The small group meetings will take place in East, West and central locations around the island. We are currently seeking meeting spaces and will be reaching out to the community to provide locations. We are grateful to the Human Rights Commission for their expression of support for this valuable initiative. “Over the past few months, CURB has reached out to the community to find facilitators, mediators and skilled individuals who would be willing to facilitate the truth and reconciliation meetings and are grateful to the following individuals who have volunteered their services: Caitlin Conyers, Gwendolyn Creary, Frances Eddy, Hashim Estwick, Cordell Riley, Michelle Scott, Jodi Virgil, Stacey Lee Williams, and Lynne Winfield. “Confronting something does not mean it has to be confrontational. Participants will be able to speak about their experiences in a supportive environment,” Ms. Winfield said. Update 6.09pm: Opposition Leader David Burt said, “For some time now CURB has been at the forefront of expressing what should be our collective desire for racial justice in Bermuda. “Their truth and reconciliation project announced today is a further and critically important step along this path and has the real potential to help Bermuda heal itself. Issues relating to race remain relevant in Bermuda and we must address them if we are to make true progress in our society. It’s a toss up as to which press conference produced the most excrement; Curb or Donald Trump’s. Virtue signalling at its finest…. Why are you so hell bent on promoting a division, when you should be promoting the collective. If people see each other by differently because of race, then promoting those differences perpetuates and widens that division. Instead CURB should put their energies into promoting the commonality between a people. We are one people. This is not rocket science to understand. MLK reasoned this, why can’t you. You don’t get it; this stuff is taught and reinforced in households, schools, churches, clubs, banks, corporations, institutions and attitudes in general. It only takes one and the group conforms. They conform because there a consequences. Then educate those that are teaching it, that they are wrong to spread division. I think that having such conversations, with both sides having opportunities to speak, is a good idea. However, it looses all credibility when it’s Curb who is promoting it. Agree completely! You lost me at CURB. No thanks. “Trained facilitators”. Could CURB provide information on the training and experience of each of the facilitators, please? Clearly they feel this is an important aspect to the process so further detail should be provided. Cue CURB. Right on schedule!!! As if last week was not enough. Difficult to see CURB achieving anything with the same two operatives running the show. Unrest?? 100 people being unlawful is not unrest, it is 100 people breaking the law. Why don`t you address that instead of turning it into a race toy for you !! It’s all them and their standing in the community. They have a mission to be heard because the average person wants no part that’s why they join forces hopping to get more on board. Best thing recipients can do is walk away or listen and then kick them to the curb. Will CURB make an apology for their racially motivated promotion of drisciminatin and second class citizenship for long-term residents? Thank you for doing this we need healing and the first step is speaking about it. Some people may wish to live in the past but that generally is not helpful. I would like for CURB to point out which law that is on the books and being used in 2017 is racist? What law or policy being used today is racist? Which law or policy ‘continues the legacy of prejudice and inequity”?? 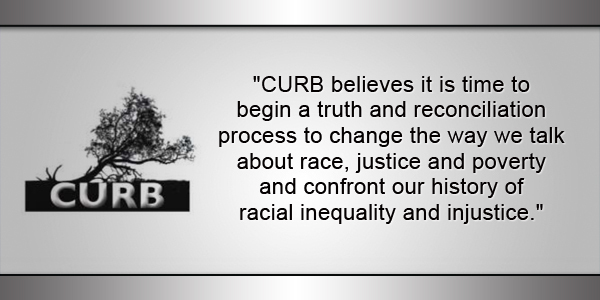 CURB wants to promote a racially equitable and socially just Bermuda – please explain. Please point out the laws, policies, people and institutions that in CURB’s world prevent this from being the case. In Bermuda there IS equality of opportunity. Have a read of the Aspen Institute study from 2014. Sadly, there is not equality of opportunity yet. Those who feel there is would very much benefit from listening to modern day stories from individuals in the black community. I see it with my own eyes and I am white. For example, a black Bermudian friend of mine in IB with a strong black Bermudian accent was told to “adapt” her accent but the strong accented Glaswegian guy was fine. There were no issues with her job performance or aptitude, the feedback was simply to change her accent. That, to me, implies that “whiteness” remains the standard and that isn’t fair or equitable. Perhaps her accent affected her promotion potential. That isn’t fair either. So, with respect, I think yo may need to hear some people’s stories and try to become more aware. It isn’t just about laws. You may be jumping to conclusions, perhaps it was because she was female? Could also be because she’s a woman. Sexism is alive and well in 2017. But I do know from personal experience that some companies hire Bermudians as ‘tokens’ in order to get their work permits approved for the employees they want. I’m white. I think sometimes it’s more to do with being Bermudian and female. Ps, just wanted to clarify that my friend does not use incorrect grammar, simply her pronounciation of words is very Bermudian. It is unfortunate that so many people here are negative about bringing about further understanding and, hopefully, empathy across the island which will, in turn, help to heal old and current wounds within the black community. That would be a benefit for all of us, wouldn’t you agree? The philathropist who just died, Feeney, paid for a study in 2014 by the Aspen Institute. Skip to part 2 if you are short on time to try to understand what needs to be done to really improve race relations. Pretending that we are all the same with all the same experiences is hollow and unhelpful. By the way, I am white Bermudian. That’s all well and good. I think a lot of liberal whites would love to see some sort of real reconciliation to occur. However given their record, CURB are not the vehicle to do it. Mr. Feeney is still alive and your Aspen Report reference is a very good one. This statement below from the Aspen Report makes so much sense given the fragmentation in Bermuda – on so many levels- Church, Union, Charity, Philanthropy, Politics…..
Maybe CURB could encourage some groups to merge and model a shared vision to get the ball rolling. How can we move from what looks like a series of separate EGO systems to an ECO system that serves all of Bermuda? It makes little sense for civic organizations committed to supporting fragile families and communities to continue working in relative isolation. Racial inequities thrive on civic fragmentation. If better connected, the collective voice and resources of civic organizations might make a significant difference in reframing policies and practices related to opportunity. But this coordination is unlikely to happen unless these organizations can see that they seek a common objective: a Bermuda that takes better care of its poor, vulnerable and less successful citizens. Im not saying that we should’t have these discussions or a Truth and Reconciliation process. We should! But it’s CURB. I just find that they twist information. I get it that they are battling racism but If this is about what happened on Dec 2…I am in no way supportive. Those folks broke the law. Straight up. CT do you want a gold star because you are white? You are simply virtue signalling…..
right. And I suppose next you’ll say there’s equal opportunity in all respects for women too. Again, there isn’t. There are systemic biases everywhere. If what you say is true, Bermuda would be the only country on the planet with straight up equal opportunity for all. It isn’t true. There clearly is equality of opportunity. You are confusing opportunity with outcome – there is a difference…. CURB not perfect but could it be that perceptions is distorted by rigid world views? Do you try to understand why CURB takes positions that they do? Have you ever attended meetings or public forums presented by CURB? Do you have a bias that could use a change? Some of you believe there is equal opportunity. Many, but not all our laws support this ideal, however, in real life it is quite another matter. This business of equal opportunity is likely to come up as a topic during this initiative. If you believe that equal opportunity is reality for everyone go to these sessions and listen to the stories. Ask yourselves this: What is stopping me from wanting to know? For those who are critical of CURB I encourage you to become part of the process. I am sure your opinion will be just as welcomed as mine. there is no man on earth that can reconcile the differences that we were born with and the future that is no in their hands, I see some thirsty people trying to validate their existence and minimize the importance of honesty and truth in general, Ralph Commisiong already did the BIG Conversation, so how does CURB think they can reconcile differences? Please tell me! You have no power to do so unless you uproot Lynn Qhitfield first!